If you don’t want to have a marriage ceremony full of rites and rituals, you can go in for a civil marriage. A civil marriage (court marriage) is permissible under the Special Marriage Act of 1954. In case you, an Indian national wishes to marry a foreign national, you must file notice for Intention for marriage with a marriage registrar of your choice in India. The registrar will publicize the notice of intended marriage for a period of 30 days. If there are no objections raised, the registrar is free to solemnize the marriage. The notice of marriage intention is publicized only of one partner is permanently resident in India and the other is a temporary resident. If one partner is residing in India and the other in a foreign country, both have to fill a form for intended marriage with any marriage registrar in India. The foreign national must also fill and sent back another copy of the form from his home country to her partner in India who will submit the form to the Indian marriage registrar. After both forms are submitted, a waiting period of 30 days is set aside for inviting any objection. After this period, Court marriage Chandigarh is solemnized. As per the Special Marriage Act, the signatures of three witnesses, the couple and the overseeing registrar are duely obtained and the ceremony completed. The marriage certificate is issued to the couple who will require it for variety of purposes like obtaining a visa. • If parties are divorced, then copy of final decree of divorce. • Evidence of the party’s stay in India for more than 30 days. For example, an American citizen who wants to take part in a civil marriage ceremony in India has to present the Marriage registrar/ officer a no objection letter from the US consulate and proof of termination of any previous marriage. Thus, a citizen of any foreign country is required to present such documents obtained from their respective consulates in India. A court marriage lawyer will help guide you through the court marriage procedure in Chandigarh. One important step is the waiting period of 30 days in which the notice of marriage intention is publicized and any objection to the marriage union will be raised. The groom must be 21 years and the bride 18 years. Both parties must be of sound mind and must be monogamous. 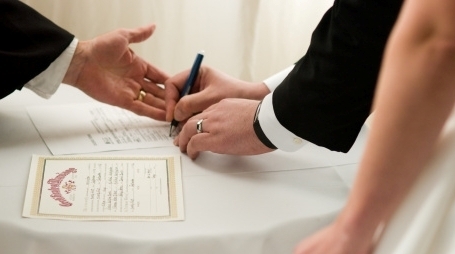 Prior to the procedure for solemnizing the marriage, three witnesses and the two parties must sign a declaration before the marriage officer, who will also sign the document. The marriage must contain exchange of the following statement: I (name) take you (name) to be my lawful (husband or wife). After this solemnization, the certificate of marriage will be entered in the Marriage certificate book by the officer. The three witnesses and the couple must sign in this book. The entry is a permanent record for the validity of the marriage.